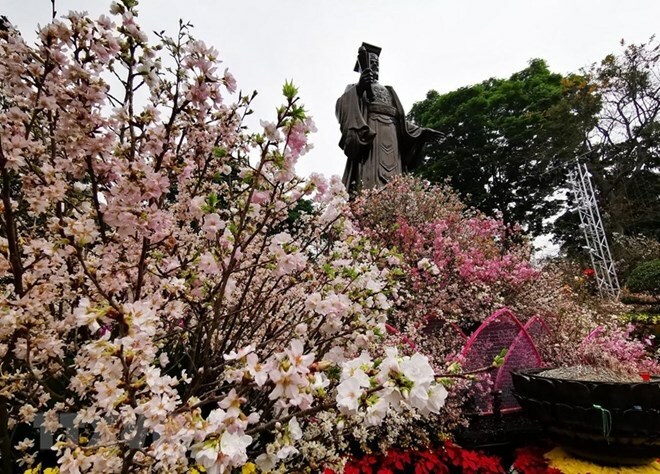 Hanoi (VNA) – Some 20,000 cherry blossom branches and 100 cherry trees of Japan, along with hundreds of local flowers are showing off their beauty in Hanoi during a festival that kicked off on March 29 night. During the three-day festival, visitors enjoy Yosakoi (a unique style of street dance performed by large teams), Japanese cuisine, Shogi (Japanese chess), and Kendama (literally “sword and ball”, a traditional cup-and-ball toy). Vietnamese arts also form part of the festival, including ca tru (ceremonial singing) and hat xam (busking music often performed by blind artists). In his opening remarks, Vice Chairman of the Hanoi People’s Committee Ngo Van Quy, said the 2019 Japan Cherry Blossom Festival is expected to help increase mutual understanding between people of Vietnam and Japan, and deepen the bilateral relationship in an effective manner. Isao Ijima, Special Advisor to Japanese Prime Minister Shinzo Abe, noted his hope that more Vietnamese will come to Japan to study, work and travel in the time ahead. Isao Ijima said cherry tree planting in Hanoi helps local residents understand more about Japanese culture, and tighten the friendship and mutual trust between the two countries.